Powder coating has long been a popular finish for metal items, but not all providers offering powder coating are truly experienced or qualified. When applied incorrectly, power coating can leave an uneven finish on items, also leaving them vulnerable to damage. At Electro Tech Powder Coating, we have over 18 years’ experience in the industry, and from the most basic project to the largest items, we offer custom power coating services that you can trust. We even work with manufacturers and fabricators around the southern California area, and our meticulous attention to detail and environmental compliance sets us apart as a top-quality powder coating provider. Do You Work With Automobile or Motorcycle Parts? Car enthusiasts in our area know that we are their go-to source for powder coating specialty cars, including ceramic coatings for exhaust systems. 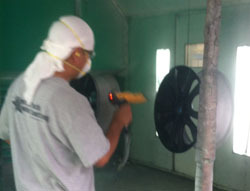 We also offer custom powder coating for wheels, so that our clients can customize their vehicles in any way they like. With over 200 custom powder coating colors in stock, as well as pearl and ice chip additives, we can provide the perfect finish to match any vision. We also offer samples so that our clients know exactly how their finished items will look, as well as color matching in case they can’t find that perfect shade in our inventory. What sets Electro Tech apart from other providers is our family-owned and operated foundation, combined with culture of personalized service and integrity. We want our customers to feel valued, and that their projects are as important to us as they are to them. We focus on maintaining the highest standards without sacrificing job turn-around time. Every project is carefully inspected upon completion, and nothing leaves our facility unless it meets our standard of excellence. If you would like to know more about custom powder coating, or to see samples of our work, call the Electro Tech team and we will be more than happy to assist you.